The Sultanate of Oman is in the process of establishing the legal and regulatory framework that will be applicable to Islamic banks and to the Islamic “windows” of conventional banks that are licensed to operate in Oman. Various Islamic banks and windows are being structured and are preparing their initial product offerings. Over the coming months, the Client Alert will be publishing a series of articles introducing basic Islamic banking concepts, and we will continue to address a range of Islamic finance topics of interest to Omani businesses. This month, we begin with an introduction to general principles and structures applicable to Islamic banking around the globe. This introduction is not intended to indicate or imply that any Islamic bank or window licensed in Oman will adopt and apply any specific structure or product discussed in the Client Alert. Each Islamic bank and window will have a palette of products that is tailored to that bank or window and its clientele. The particulars of these matters will evolve as the banks and windows are formed and develop, and we will follow these formations and developments for you as they materialize. Each Islamic bank or window will have a unique Shari`ah supervisory board that will guide that bank or window in designing and implementing its products and conducting its banking activities. While the relevant policies and regulations have not been finalized as yet, we understand it is proposed that each Islamic bank and window in Oman would be free to determine the composition of its Shari`ah board, subject to some minimal constraints. Examples of such constraints could include a requirement as to the number of scholars on a Shari`ah board (not less than three is currently being discussed), limitations on the number of boards on which an individual scholar may sit (no more than two boards in the Sultanate), and a requirement that boards include Omani Shari`ah scholars as well as internationally recognized scholars. At present, it does not appear that there would be a requirement for the scholars to be from specifically identified madhahib (schools of Islamic jurisprudence); the individual banks and windows would be accorded discretion to comprise their Shari`ah boards as they determine appropriate and prudent. We also understand that there will be no central Shari`ah board at the governmental level (such as a Shari`ah board at the Central Bank of Oman). The Sultanate will likely take the position that allowing the banks and windows relatively unfettered freedom and discretion in this regard generates greater creativity and responsiveness to market needs and desires. Islamic banks and windows perform much the same intermediation functions in the banking system as conventional banks. They provide (a) asset transformation activities, (b) administration of payments systems, (c) brokerage services, and (d) risk transformation services. Asset transformation involves the matching the supply of, and the demand for, financial assets and liabilities (e.g., deposits, equity, credit, loans, insurance). Transformative activities relate to modifications in the scale, maturity and location of instruments and assets. Payments administration involves, primarily, check transfer activities, electronics funds transfers, settlement activities and clearing activities. Brokerage activities relate to linking sellers and purchasers of instruments to each other. Risk transformation pertains to facilitating the supply of, and demand for, intangible and contingent assets and liabilities, including guarantees, collateral, financial advice and custodial services. As a theoretical matter, there are three Islamic banking models. They are commonly referred to as (a) the two-tier mudaraba (service partnership) model, (b) the two windows model, and (c) the wakala (agency) model. Any given Islamic bank or window may utilize elements of more than one of these models. Before considering these three models, it is conceptually important to recognize that there are two different types of deposit accounts in the Islamic banking models. These accounts are the sources of funds for Islamic banks and windows. Money deposited with a bank by a depositor may go into a demand deposit account or it may go into an investment account. Generally speaking, there are two types of demand deposits: savings deposits and current deposits. In a savings deposit, the depositor may deposit and withdraw money at will, and some banks require minimum deposits. Structures used for savings deposits include qard hassan (non-interest-bearing loan), wadi`ayaddhamanah (guaranteed safekeeping), and, somewhat infrequently, mudaraba. In a current deposit, money can be deposited and withdrawn at any time and the account is accompanied by a checking capability or a multifunctional card. Structures used for current deposits include qard hassan, wadi`ayaddhamanah, and, somewhat infrequently, mudaraba. Generally, demand deposit accounts do not earn returns (unless a mudaraba structure is used). Funds that go into investment accounts are invested, with the investments being managed or directed by the bank. The depositor may lose its deposit in the investment account and, as discussed below, the bank may not guarantee any return of the principal amount of the deposit or on the deposit. Generally speaking, there are two types of investment accounts: term deposits; and investment deposits. In a term deposit, money is deposited for a specified minimum period or term and may be withdrawn only at the end of the term. The maturities used for these accounts are frequently one month to a few years. The structures used for term accounts include mudaraba and wakala. An investment deposit is usually a profit and loss sharing account. Structures used for investment deposits include mudaraba and wakala. The terms “deposit”, “deposit account”, “depositor” and similar terms are used in this Client Alert because of their familiarity in connection with conventional banking practices. However, under Islamic banking principles these are not deposits as conventionally conceived. In many instances they are more in the nature of capital contributions (in the case of monies placed in investment accounts) or loans or safekeeping deposits (in the case of demand deposits). Returns of and on investment deposits and returns on demand deposits cannot be assured under relevant Shari`ah principles, including by way of deposit insurance as conventionally conceived in most bank regulatory systems. We understand that the Central Bank of Oman will require Islamic banks and windows to make premium payments to the central deposit insurance program and will require that “depositors” into Islamic banks and windows be afforded deposit insurance protections equivalent to those afforded to depositors in conventional banks. It is not yet clear how Shari`ah-compliant depositors will be treated in respect of this deposit insurance. Possibly they will be permitted to decline any deposit insurance payments that may be tendered to them (such a resolution was effected in the United Kingdom). We will consider this matter in a future Client Alert and/or blog posting. We begin our discussion of the core Islamic banking models by focusing on the two-tier mudaraba model and investment deposits. This requires, as background, a brief introduction to the mudaraba contract because that contract is used on both sides of the bank's balance sheet and integrates assets and liabilities. 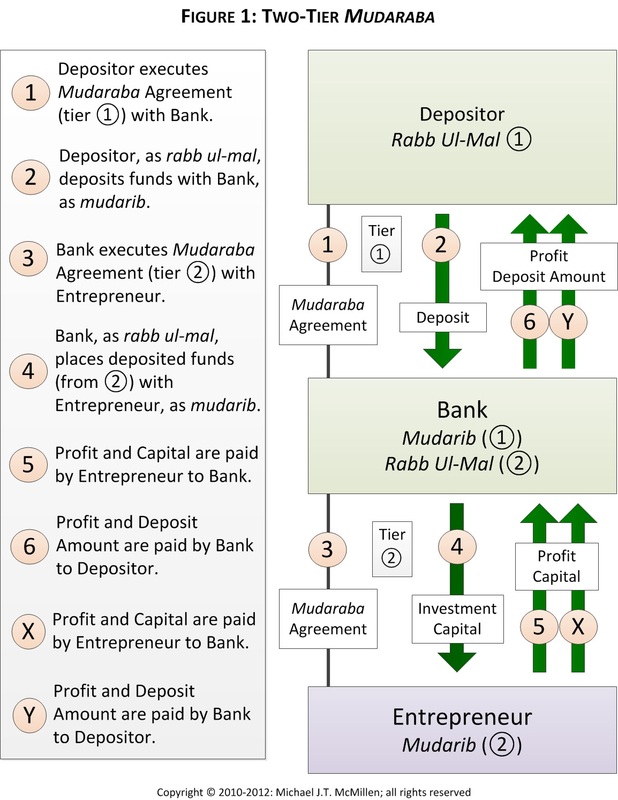 The first-tier mudaraba contract is between the investor or funds provider (the depositor) and the bank. The mudaraba agreement provides for a sharing of profits on investment of those deposited funds as between the depositor and the bank. The second-tier mudaraba contract is between the bank, as investor or funds provider, and third-party entrepreneurs who are seeking funds and agree to share profits with the bank according to the percentages stipulated in the second-tier mudaraba contract. In the two-tier mudaraba model, both the mobilization of funds (first-tier mudaraba) and the utilization of funds (second-tier mudaraba) are conducted on the basis of profit and loss sharing. A mudaraba contract structures and defines a type of partnership arrangement in which (i) one or more persons (the “rabbul-mal”) contribute money (or other capital) and (ii) the other person (the “mudarib”) provides services, such as investment of the money provided by the rabbul-mal. In the banking context, each “depositor” that places funds as an investment deposit is a rabbul-mal. The mudarib is the bank that manages the investment of those deposited funds. Those funds are held in trust by the mudarib for the benefit of the depositor rabbul-mal and the bank must use its best efforts to accomplish the objectives of the mudaraba contract. Frequently, in Islamic banking, there are relatively few restrictions on how the bank may invest those funds. A defining characteristic of the mudaraba is that losses from the operation of the mudaraba must be borne by the depositor (rabbul-mal) absent misconduct, default or breach of contract by, or negligence of, the mudarib. The mudarib suffers the loss of its services, and therefore no loss of capital. Allocation of profits to the bank and the depositor is specified in the mudaraba contract, usually in terms of ratios or percentage allocations or on the basis of a points system that takes cognizance of the amount of the deposit and the time for which the deposit is maintained. As the investment of a depositor’s funds is usually effected jointly with funds from all depositors, these allocations take into consideration the respective amounts and timing of all investment deposits by all depositors. Profits earned by the depositors are often calculated as a percentage of total banking profits. A generic two-tier mudaraba model is illustrated in Figure 1. At the first tier (between the investor (depositor) and the bank), the investors enter into a mudaraba contract with the bank to share profits accruing on the investment account in accordance with defined ratios, percentages or formulas. It is impermissible to guarantee a return to the depositor. The investors then deposit (or contribute) their funds in investment accounts. The liability and equity side of the bank’s balance sheet shows the deposits or contributions accepted on a mudaraba basis. These are not liabilities (the capital is not guaranteed). They are a form of limited-term, non-voting equity. 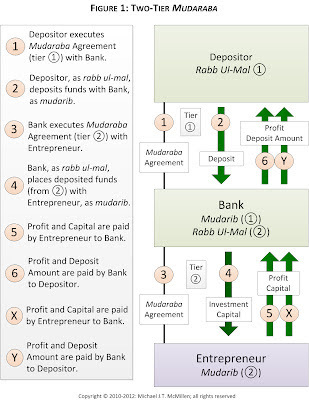 At the second-tier, the mudaraba contract is between the bank (as the funds supplier and rabbul-mal) and entrepreneurs (mudarib), who share the profits from investment operations according to the terms of this contract and in accordance with specified ratios, allocations or formulas. Again, guaranteed returns to the rabbul-mal (the bank) are impermissible. It is apparent from the foregoing description that the asset and liability sides of the bank's balance sheet are fully integrated, thereby minimizing the need for asset liability management, which, in turn, provides stability against economic shocks. The two-tier mudaraba model has no reserve requirements for the investment accounts because these are profit and loss sharing accounts. Demand deposits may be accepted in the two-tier mudaraba model. These deposits provide no returns and are repayable to the depositor on demand, at par. Thus, they are treated as liabilities of the bank, but frequently have no specific reserve requirements. The two windows model utilizes both demand deposits and investment deposits. The model divides the liability side of the bank’s balance sheet into (a) a demand deposits window and (b) an investment balances window. The choices regarding allocation of a depositor’s funds into each of the two windows are left to the depositor. The demand deposits yield no returns as the deposit is returnable on demand, at par. These amounts are treated as liabilities. The bank may earn a service fee for safekeeping services rendered by the bank in connection with the demand deposits. As a regulatory matter, and quite differently from the two-tier mudaraba model, the reserves applicable to the demand deposits will be 100%. This is because the funds are treated as amanah safekeeping deposits and do not bear the right of the bank to use the funds to generate further profits on a fractional reserve basis. The reserve requirement applicable to the investment deposits will be 0% as these amounts are to be invested, are subject to losses, and may not be guaranteed. Shari`a Standard No. (23) Agency (“Standard 23”) of the Accounting and Auditing Organization for Islamic Financial Institutions (“AAOIFI”), § 2/1, defines wakala as "the act of one party delegating the other to act on its behalf in what can be a subject matter of delegation“. 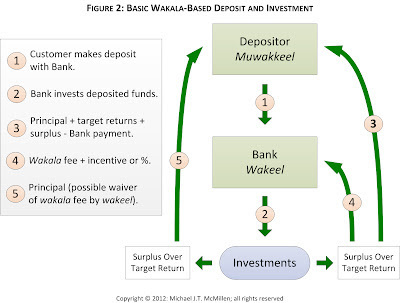 In the wakala or agency model, the bank acts as an agent or wakeel for and on behalf of the investor-depositors and investment deposits on a fixed fee basis. 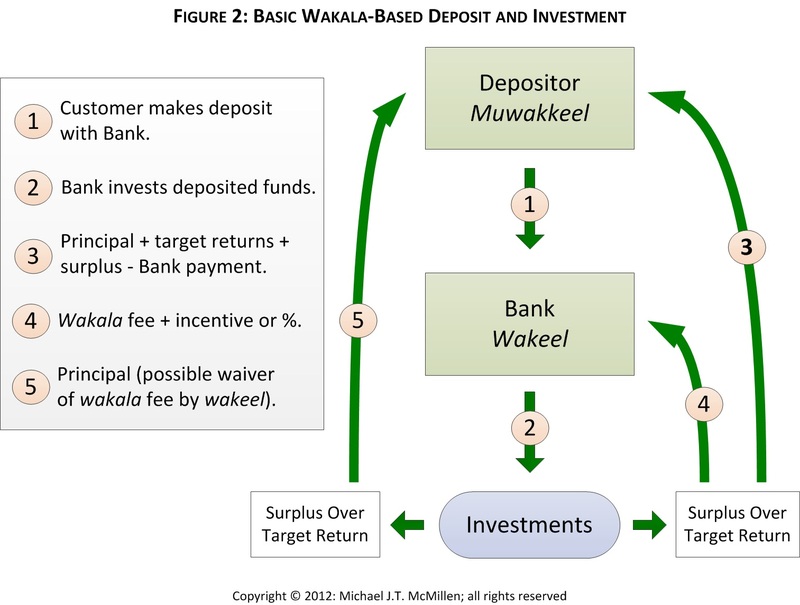 A generic wakala-based deposit and investment model is graphically depicted in Figure 2. The bank generally has broad discretion as to how to invest the deposited funds (so long as the investments are Shari`ah compliant) and notifies the depositor of the profits and losses. Frequently, the bank will retain profits in excess of a specified rate of return as an incentive fee. The depositor, as principal (muwakkeel), is responsible for all risks associated with the transaction except for those relating to the agent’s misconduct, fraud, breach, default or negligence. Guarantees of the deposit are generally impermissible. The terms of the contract are determined by mutual agreement. On the liabilities and equity side of the bank’s balance sheet, the bank's relationship with the investor-depositors might be based on a mudaraba, amanah, wakala or wadi`a. On the assets side of the bank’s balance sheet, the bank has more choices and freedom to invest the depositor’s investments. There is a broad range of asset investment possibilities, including mudaraba, ijara (lease), istisna` (construction or manufacture financing), murabaha (cost-plus sale), salam (forward sale), and musharaka (partnership). A wakala is a non-binding contract. The principal or the agent may withdraw at any time by (a) mutual agreement, (b) unilateral termination, (c) discharging of the obligation, (d) destruction of the subject matter, or (e) death or loss of legal capacity of the contracting parties. There are some exceptions to the non-binding nature of the contract. The contract may become binding where (i) the agent is paid, (ii) the rights of third parties are implicated or involved, (iii) the agent starts a task that cannot be stopped without causing damage or injury to the agent or the principal, or (iv) either the principal or the agent promises not to revoke the contract for a specified period. Agency arrangements can be general and comprehensive or specific and restricted (although the Ḥanafīs and Mālikī, as a classical matter, have ruled general wakala arrangements invalid as they may lead to excessive uncertainty (gharar)). The agent can be paid or unpaid. Where the agent is paid, the rules of ijara (for services) are applicable. The qard hassan structure applicable to savings and current account deposits builds upon the concepts set forth in AAOIFI Shari`a Standard No. (19), Loan (Qard) (“Standard 19”). That standard defines a qard as the transfer of ownership in fungible wealth to a person upon whom it is binding to return wealth similar to it. The aim of the qard hassan structure is to provide depositors with guaranteed safekeeping of deposits and to allow banks to use the deposits for its banking and business activities. The deposited amount is treated as a benevolent loan. The bank is entitled to use the deposited funds without authorization from the depositor. The bank has an obligation to repay the principal amount of the loan and the principal amount of the loan is guaranteed. No dividends or returns are due in respect of the deposits. However, the bank is permitted, in its discretion, to provide, as a gift (hibah) to the depositors, a return on the deposits, although that gift may not be pre-agreed in the deposit contract. Wadi`a-based deposit structures are also used for savings and current deposits. A wadi`a (or ida - deposit) is a deposit for safekeeping. The deposited property must be owned and deliverable and a form of property that can be possessed physically. There are two general types of wadi`a arrangements: wadi`ayadamanah and wadi`ayaddhamanah. Wadi`ayadamanah refers to safe custody based on trust. The custodian must treat the property with the same degree of care as if it were his or her own property and has a duty to protect the property from being lost or damaged. The custodian is not responsible for damage to the property unless it is due to misconduct, fraud, breach, default or negligence. The custodian is not entitled to profits gained from the contract and any benefits that accrue from the deposit belong to the owner. Anything other than safekeeping of the property (e.g., hiring or lending of the deposited property) requires the permission of the owner. The custodian must return the deposited property to the owners upon the depositor’s request. Wadi`ayaddhamanah is the more common type of wadi`a in Islamic banking circumstances. It involves guaranteed safe custody in which the custodian guarantees the return of the property. It is a combination of two contracts: wadi`a, or safekeeping, and dhaman, or guarantee. This arrangement may arise if the custodian uses the property for business purposes, destroys the property, or mixes the property with other property in a manner in which the original property cannot be differentiated. The custodian is entitled to use the deposited property for trading or other business purposes. The custodian has a right to income derived from the utilization of the deposited property and, at the same time, is liable for any damage or loss to the disk deposited property. The custodian owns the profit and therefore has no obligation to give a portion of the profit on the property to the depositor, but may do so as a matter of gift (hiba) so long as that is not pre-agreed. The gift concept, in both forms of wadi`a, is controversial among Shari`ah scholars. The custodian must return the deposited property to the owners at upon the request of the depositor. Future Client Alert articles will address various types of retail and wholesale products used by Islamic banks and windows and various types of financing and investment products used in the Islamic finance and investment industry. As the Sultanate of Oman prepares to roll out its new legal and regulatory framework for Islamic banking in the coming months, we will be covering Islamic banking in the Client Alert to educate readers on this important and growing field. This article is the first in a series by Curtis partner Michael J.T. McMillen, an Islamic finance specialist based in our New York office who provides support to our Islamic banking practice in Oman and throughout the Middle East region.